In large bowl, mix 2 tablespoons of the butter, 1/2 teaspoon of the salt and 1/4 teaspoon of the pepper. Add potatoes; toss to coat. Place potatoes skin sides down in single layer on pan. Roast 23 to 25 minutes or until tender when pierced with a knife. Remove from oven; stir. In same large bowl, mix remaining 2 tablespoons butter, remaining 1/2 teaspoon salt and remaining 1/4 teaspoon pepper. Add chicken and asparagus to mixture, and toss to coat; arrange in single layer in pan next to potatoes. Brush chicken with honey. Roast 17 to 20 minutes longer or until juice of chicken is clear when center of thickest part is cut (at least 165°F) and potatoes are browned and fork-tender. Squeeze 2 of the lemon slices over all. Top with basil and parsley; serve with remaining lemon slices. If some of your potatoes are larger than others, instead of quartering them, cut into 6 wedges. Want to use chicken breasts instead? Substitute 4 (5 oz) boneless skinless chicken breasts. What do you get when you combine, fresh herbs, tart lemon juice and savory chicken thighs? An irresistible and easy lemon-herb chicken dinner to make on the regular. So easy that with a little planning, this sheet-pan chicken dinner is the perfect addition to your sheet-pan dinner prep plan. 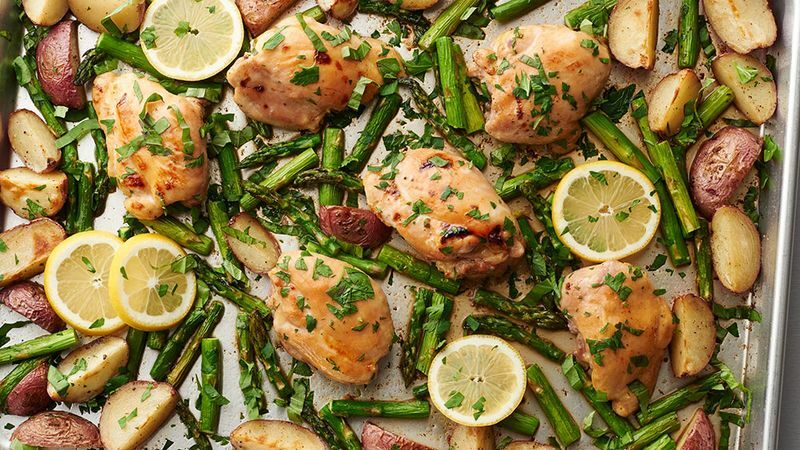 We love this chicken paired with the fresh spring flavors of lemon and asparagus but depending on the season or your mood, there's no limit to the delicious vegetable combinations you can come up with. One of the best things about chicken is that it pairs well with virtually any and all sides, right? We've got more chicken where this came from so follow us to more tasty chicken recipes.